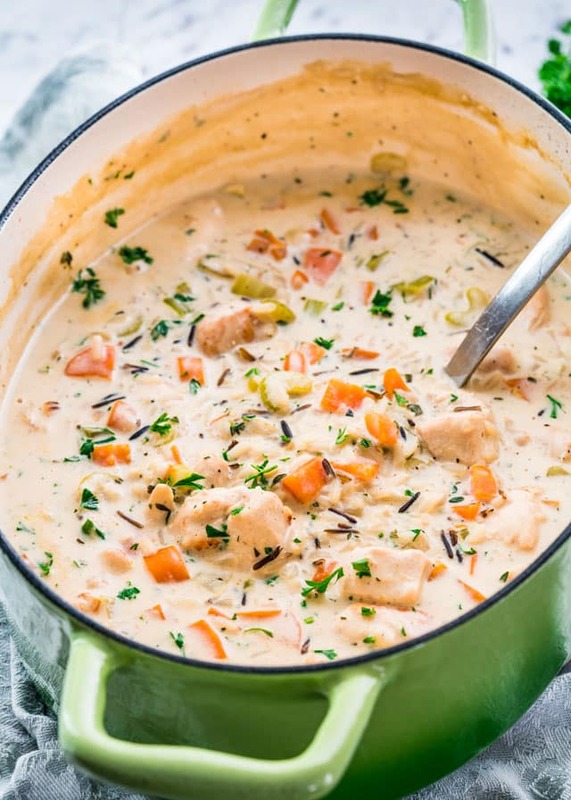 This One Pot Turkey Wild Rice Soup is easy to make and perfect for a cold winter day. It’s loaded with turkey, wild rice and veggies and goes perfectly with some crispy bread. Everyone needs a good comforting bowl of soup on a cold snowy winter night that’s loaded with good stuff and it’s incredibly delicious. 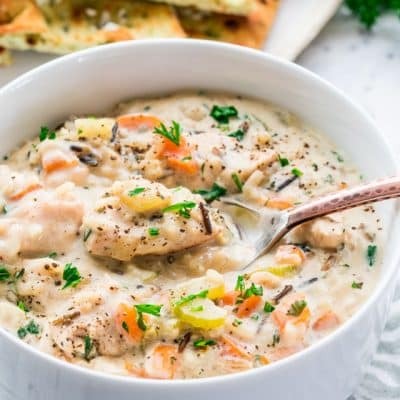 I usually tend to prefer thicker soups such as this turkey wild rice soup that requires just one pot and is very simple to prepare, yet it’s hearty and satisfying. This soup start with turkey breast which I cooked first. Leftover turkey is ideal for this soup, or even leftover roast chicken. The base for this soup is a mirepoix (onions, carrots, celery) which is the base for pretty much any soup. To thicken it I used some flour and half and half to make it super creamy. For a lighter version you can use milk. Of course we can’t have turkey wild rice soup without the wild rice. I used a cup of wild rice, but if you like a thinner soup, use a bit less. I like a lot of fresh herbs in my turkey wild rice soup so I added lots of rosemary, thyme and oregano. I hope you give this soup a try because it’s so delicious and satisfying, especially with the super cold weather we’ve been having. It’s pure comfort in a bowl. 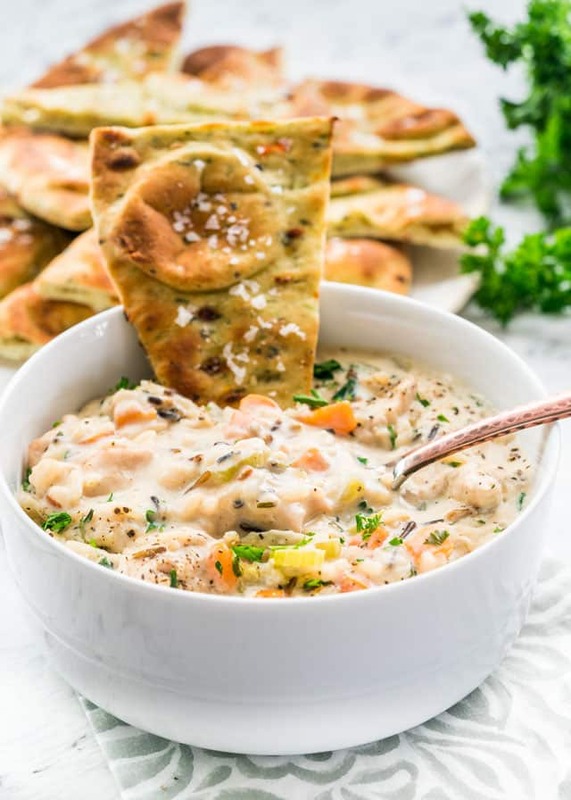 This soup pairs beautifully with my crusty no knead bread or some toasted pita chips. For other hearty soups, check out my Broccoli Cheese Soup, Chicken and Corn Chowder, Lemon Rice and Chicken Soup, Beef Barley Soup or my Red Lentil and Chicken Soup. 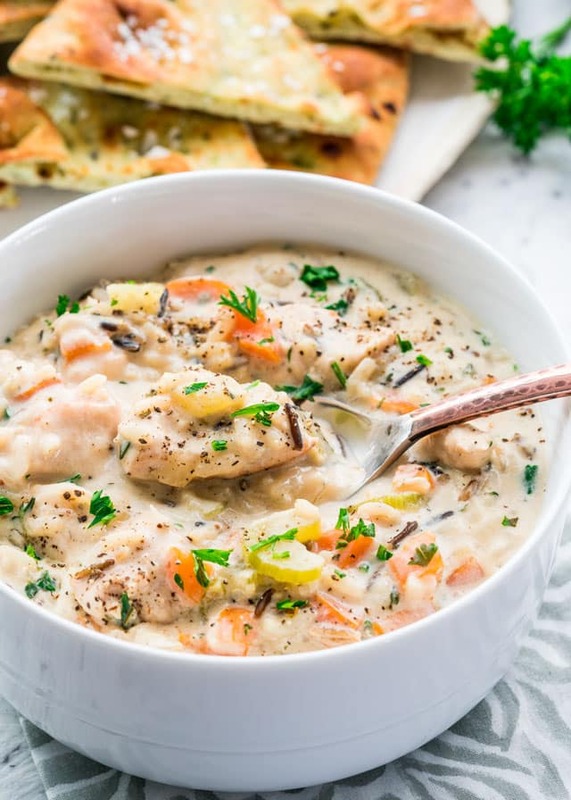 This One Pot Turkey Wild Rice Soup is easy to make and perfect for a cold winter day. It's loaded with turkey, wild rice and veggies and goes perfectly with some crispy bread. In a large soup pot, heat the olive oil over medium-high heat then add the turkey and cook until browned and cooked through, about 5 to 7 minutes. Remove the turkey from the pot. Reduce the heat to medium and melt the butter. Add the onions, carrots, celery and garlic. Cook until the onion is translucent and soft; about 3 minutes. Add flour and mix well. Slowly stir in the half and half, wild rice and chicken broth. Add the bay leaf. Bring to a boil then reduce the heat to medium-low, and cover. Cook until rice is cooked; about 30 to 45 minutes. The time depends on the rice you use, it's best to check the package for instructions. Remove the bay leaf from the soup and season with salt and pepper to taste then add the poultry seasoning and the fresh herbs. Add the turkey back to the pot and cook for another 5 minutes. Although I used turkey breast, chicken breast can be used as well. You can also use leftover turkey meat or leftover roast chicken. Poultry seasoning is a mix of different herbs including sage, marjoram, rosemary and many others. Half and half can be found near the milk and cream in the dairy section of your local grocery store. Half and half is a blend of equal parts whole milk and light cream. It averages 10 to 12% of fat. Do you think this recipe will work if I omit the half and half and flour? I’m going for a brothy soup, Any suggested adjustments to amount of broth if I make this change? Thank You so much! You can omit those ingredients for sure. The amount of broth can be left the same. If at the end you’d like it to be brothier (the starch from the rice may thicken it) you can always add some more broth and adjust the seasoning as you see fit. Thank you, Jo! So I’m gonna be one of those people that made some changes and comments about their own concoction and not the recipe as it was intended :-), but what I did changed the consistency but not any of the amazing flavors – and the flavors you came up with were definitely amazing! I made a turkey bone broth from the Thanksgiving remains and subbed that for chicken broth, and then subbed cubed chicken for cubed turkey. Also we prefer brothy soups to thick soups, so I cooked the wild rice separately and added it at the very end. I also added an extra tablespoon of flour to the mirepoix to help thicken it, since we weren’t sucking up any of the broth with the uncooked wild rice. It was a hit!! Was similar in consistency to the Maine chowders that my mom makes, which are creamy without being too thick. Oh and fresh herbs were key! – adds such verdant freshness and complexity of flavor!! I have made many of your recipes and each one is magical! Keep going strong!! Do you have to use fresh herbs? If I use dried will it taste the same? Sounds so delicious! I always prefer to use fresh herbs, the flavor is much more vibrant. You can definitely use dried herbs if you have them on hand. You are one darn good cook. You have the best recipes. I always like the recipes that are from scratch, not a box food cook. I learned a lot of WONDERFUL recipes from my mother. She was a fabulous Mother, cook, seamstress and a lovely woman. If it would be possible, it would be great to share them with you.. We grew up on beef shank, veal shank, and very European food or cooking. At that time, those cuts of meat were cheap. Little did we know what I grew up on is now considered gourmet food and is so much more expensive today. Mother used chicken feet in her chicken soup and it was the most gelatinous and delicious soup. Everything was homemade. There were five children. Dad was a coal miner in Pa. Those were memorable times. A lot of your recipes, like your turkey wild rice soup is how I cook. I love your recipes. This recipe was a success for my meal prep! I used a non-dairy half and half instead, and did chicken breast and turkey broth instead of turkey breast and chicken broth. I also switched up my seasonings a little bit (Italian herbs and some creole salt), but all in all it’s a deliciously hearty recipe! Glad you liked it, Sierra! This soup is real comfort food . If you are feeling under the weather this will keep you going . A meal in a bowl ! I added in some frozen corn with the chicken at the end – helped make it a little thicker and rounded out the flavor. Delicious! I made this soup last night, but made changes for my food allergies. I made it with already cooked rotisserie chicken, replaced the onion with 6-8 cloves of minced garlic, added a half of chopped red bell pepper, and about eight sliced mushrooms, increased the carrots, and used the celery inside the stalk along with the leaves . Instead of flour to thicken, I used instant potato flakes, which I do to thicken almost everything. I find that the prep times stated in recipes are quite understated. Once I got all the ingredients today, pulled the chicken apart, I spent well over 30 minutes prepping, and I used to be a sous chef. With all the fresh herbs (I would lower the Rosemary a bit) and some other herbs I have for soup, it was delicious. What an interesting flavor combo, I’m curious to try this dish now. Thanks for the recipe! My pleasure, hope you try it! It was delicious with garlic pita chips and a salad! That’s wonderful, so glad you liked it! Muy bueno .Lo dejo para el invierno .Aca en Argentina una media de temperatura de 30g Gracias JO. IF you use already cooked turkey or chicken, are the directions the same? Pretty much, except you won’t have step 1 where you have to cook the turkey. I don’t care for wild rice, can I use Jasmine rice instead? Sure that should be fine, just adjust the cooking time accordingly.